Medically termed as tinea pedis, athlete’s foot is a contagious fungal skin infection of the feet that initially develops between the toes and spreads to the adjoining region, sometimes as far as the toe nails. (1) If the infection happens to be particularly aggressive, it might even afflict other regions of the body as well such as the groin and palms. This infection derives its name from the fact that it’s largely prevalent among, but not limited to, athletes who are given to wearing tight-fitting shoes for prolonged periods. Moreover, people of all ages and gender run the risk of getting infected, either by picking up the fungus directly or via indirect transmission from another infected person. Dermatophytes, or the breed of fungi that is primarily responsible for this infection, is also at the root of several other skin, hair and nail infections. Since the culpable fungi requires warmth and moisture to thrive and feeds on the keratin protein found in your skin, your sweaty feet that often remain enclosed by socks and shoes serve as an ideal breeding ground. A rash or dry, scaly and flaky skin between the toes and on the soles of the feet. Stinging, burning and itching sensations between the toes and on the soles of the feet. Itching blisters on the feet. Thick, discolored and crumbly toenails. Toenails that pull away from the nail beds. In severe cases, the damaged skin may promote a bacterial infection, which can further lead to cellulitis, a condition marked by redness and swelling of the feet. Frequently wear damp socks or tight-fitting shoes. Wear shoes that cause your feet to get hot and sweaty. Don't keep your feet clean and dry. Walk around barefoot in places prone to spreading fungal infections like gyms and locker rooms. Share towels, socks, shoes, mats, rugs and linens with a person suffering from a fungal infection. Have a weakened immune system and those with poorly controlled blood sugar. Wash and dry your feet thoroughly, especially between the toes, with soap and water each day. Try to keep your feet dry at all times. Apply antifungal powder on your feet every day. When at home, walk barefoot as much as possible. Wear loose-fitting and well-ventilated shoes. Change your footwear regularly so that they remain relatively dry. Shoes need time to dry out. Medication for athlete’s foot aims to relieve itching, scaling, pain and discomfort as well as drying out any blisters. You can heal athlete’s foot and kill the fungal infection on your own using home remedies. Foot soaks and other natural remedies can effectively deal with athlete’s foot and its symptoms. Apple cider vinegar, a powerful fungicidal agent, is one of the best remedies to manage any fungal infection, be it a toenail infection or athlete’s foot. (2) It helps to control the blood sugar levels. Its acidic properties on the other hand help curb the alkaline environment on the skin to restrict the growth and spread of the fungus. There are two ways you may use apple cider vinegar to cure athlete’s foot. Simply mix 1 tablespoon of raw, unfiltered apple cider vinegar in a glass of lukewarm water and drink it on an empty stomach. Drink it once in the morning and again at night before going to bed. You may also treat your feet with an apple cider vinegar foot soak. To prepare the footbath, follow the steps below. Fill a tub with enough warm water to soak your foot. Pour 12 to 16 ounces of apple cider vinegar into the water. Soak the affected foot in the solution for 30 minutes. When done, grab a soft towel and pat dry your foot. Repeat once daily for up to 10 days to observe optimal results, although apple cider vinegar may provide relief in as little as 1 or 2 days. Vinegar also helps draw out excess moisture from the feet, thus speeding up the healing process. Fill a tub with enough lukewarm water to soak your foot. 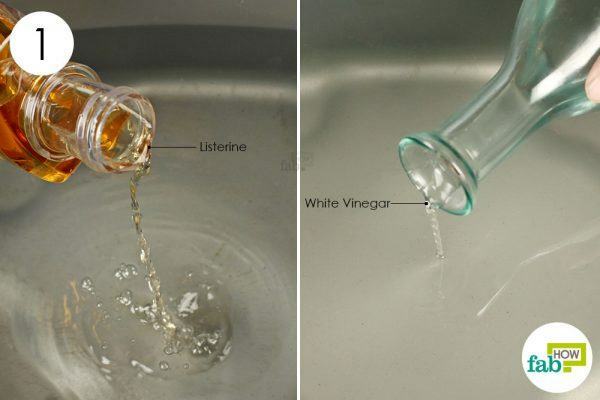 Pour approximately 1 cup of vinegar into the water and mix well. Soak your affected foot in the foot soak for 30 minutes. When done, pat your foot dry with a soft towel. Repeat once each night before going to bed for 1 week to get optimal results. Garlic also contains acids and compounds that help curb the alkaline environment in which the fungus thrives. The presence of ajoene, a compound that inhibits the growth of fungus on the skin, makes garlic an incredibly effective remedy for treating fungal infections. (4) Ajoene acts as a fungicidal agent to eliminate fungus and restrict their activity, while also reducing the symptoms of the condition. Mince 2 to 3 cloves of garlic and put them in a bowl. 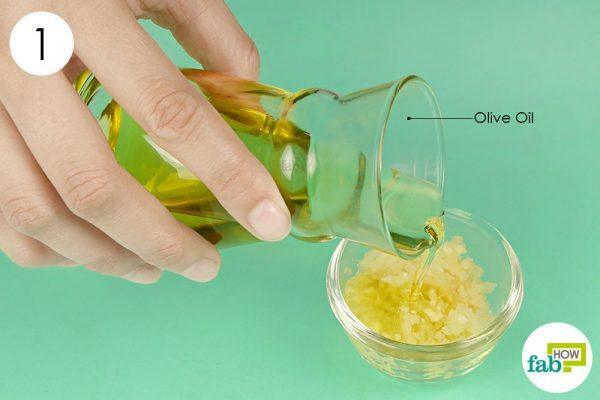 Pour ½ teaspoon of olive oil into the minced garlic. Apply the paste evenly on the infected skin. Leave it to dry for 30 to 45 minutes. 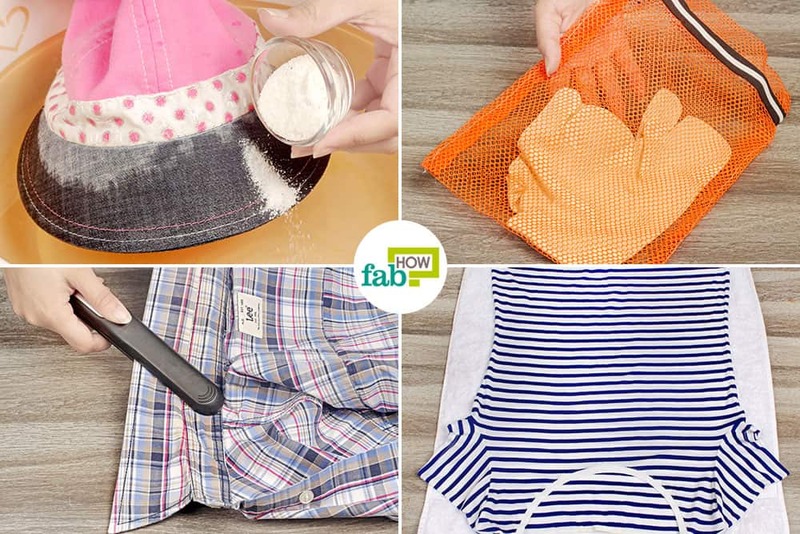 Rinse it off with warm water and pat dry with a soft towel. Repeat twice daily until you obtain satisfactory results. 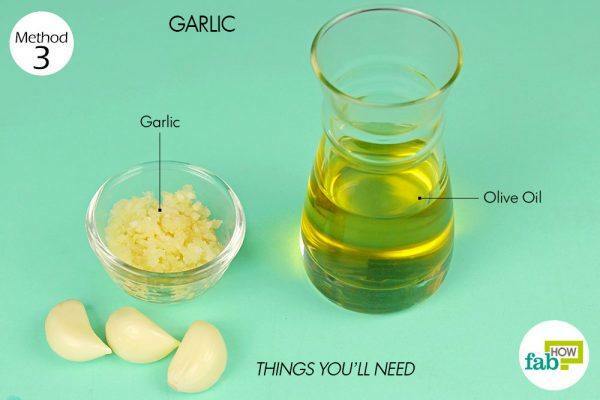 This garlic oil may provide relief in just 2 days. Listerine contains alcohol, the active ingredient that makes it incredibly good for treating fungal infections. 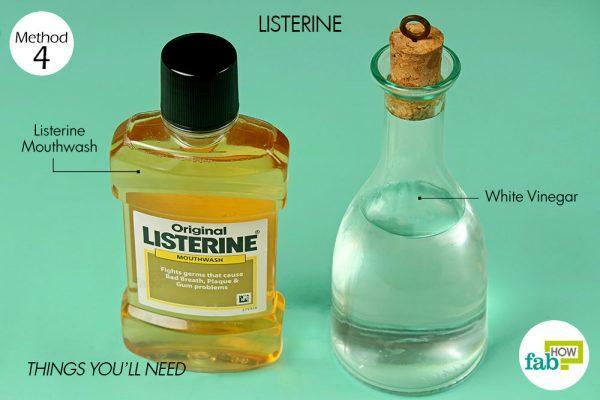 Therefore, alcohol-free Listerine won’t work well. A combination of Listerine and vinegar works even better to cure athlete’s foot, as the acidic properties in vinegar effectively inhibit the growth of the fungus. Listerine and vinegar may be used as individual remedies or in combination to cure the infection. Fill a tub halfway with lukewarm water. Check the temperature of the water to ensure it comfortably suits your skin. Make sure that the quantity of water is sufficient to immerse your feet completely. Pour some Listerine into the tub. Add an equal amount of white vinegar to it. Swirl with your hand to combine the liquids well. Soak the affected foot for about 1 hour. If you don’t have much time, you may reduce the soaking time to 30 minutes. 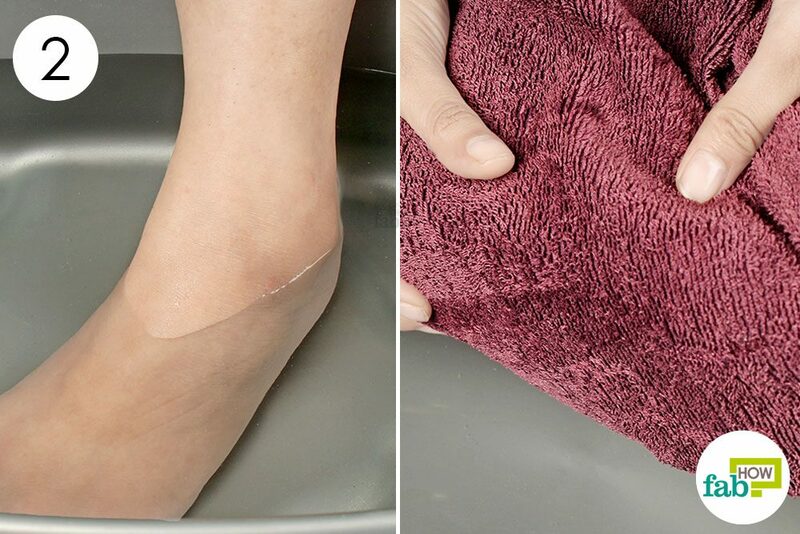 Rinse your foot with normal water and pat dry using a towel. Repeat 2 times a day for a week. The antiseptic, anti-inflammatory, antifungal, antimicrobial and healing properties of tea tree essential oil make it perhaps the most beneficial essential oil when it comes to treating pain and inflammation of the skin. 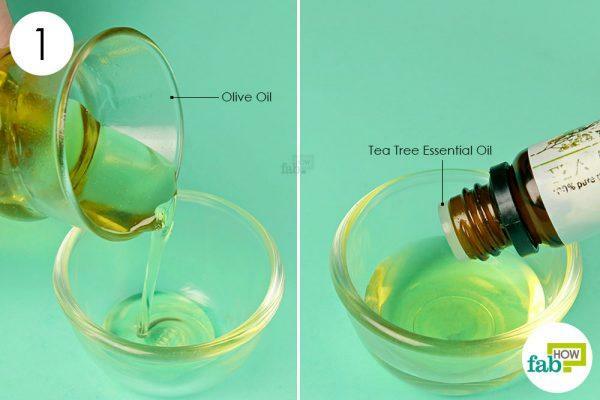 Add 5 to 7 drops of tea tree essential oil to it. Note: Always combine essential oils with carrier oil like coconut or olive oil before applying it on the skin. If used directly on the skin, essential oils can be very harsh and may lead to irritation and breakouts. Repeat twice each day for 1 or 2 weeks to get desirable results. Due to the presence of antifungal and antibacterial properties, both borax (salt of boric acid) (8) and baking soda (9) work amazingly well to cure athlete’s foot. It helps prevent unwanted moisture on the feet that is a primary cause of athlete’s foot. You may sprinkle a small quantity of the ingredients on your foot or make yourself a solution for a foot soak. Fill a large tub (large enough to comfortably accommodate your feet) halfway with lukewarm water. 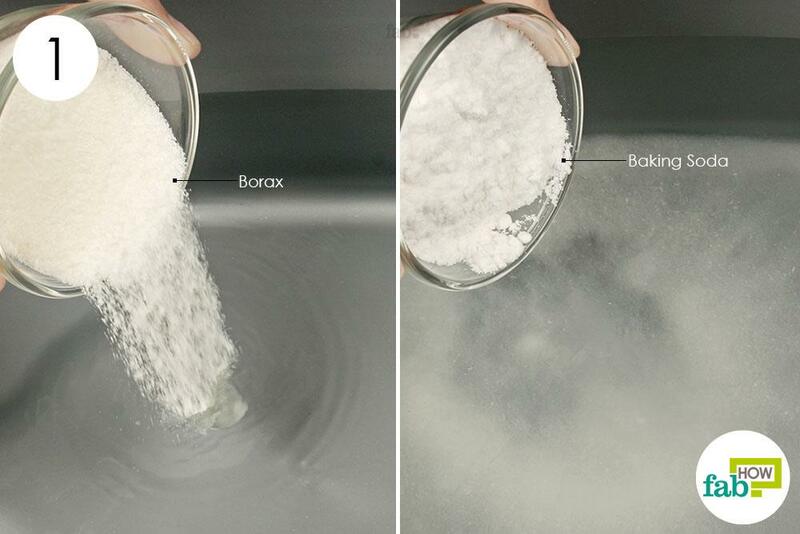 Add 1 tablespoon of borax and 2 tablespoons of baking soda to the water. 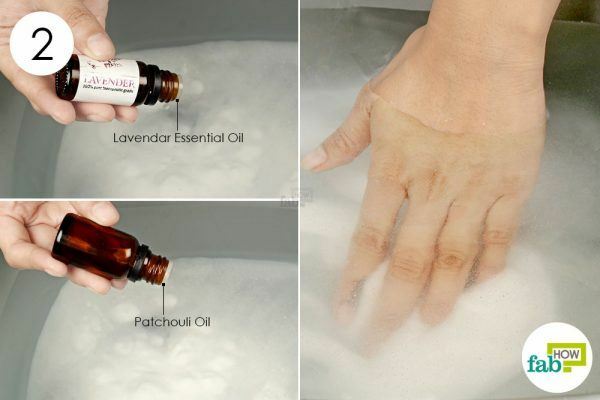 Add 4 or 5 drops of lavender essential oil and 2 or 3 drops of patchouli oil. Swirl the water with your hands to mix the ingredients completely in the water. Alternatively, you may use peppermint or rosemary essential oil. While the former has re-energizing properties, the latter is extremely good for relieving pain. Soak your affected foot in the footbath for 15 minutes. You may set the tub by a chair for a comfortable resting position. 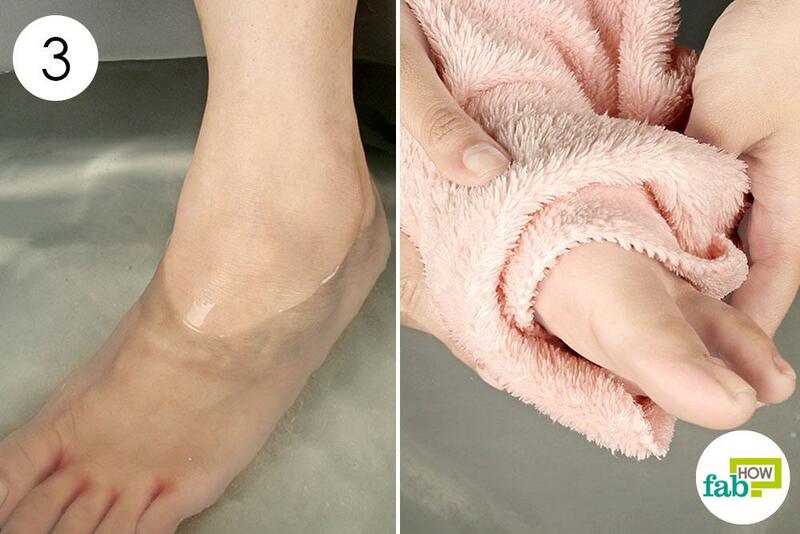 Wipe your foot comfortably with a dry towel. Be sure to dry the area completely, including between your toes. Repeat the process once each day for about 10 days to get optimum results. While there are a number of ways for using Vicks VapoRub, here we’ll explain how to use it for treating athlete’s foot. The petroleum jelly-based ingredient softens and helps slough off the infected skin. Dab some Vicks Vaporub on the affected area. Massage for 2 to 3 minutes and put on some socks. Leave it overnight before rinsing it off the next morning. Repeat twice a day for 1 week for optimum results. If your condition is severe, it may take longer, but minor cases of athlete’s foot can be cured within a couple of days. Wash and dry your feet thoroughly each day, especially between the toes. Athlete’s foot is a contagious infection. Avoid sharing towels, rugs, linens, socks and shoes to prevent spreading the infection. Wear pool slippers or sandals while using public showers. Alternate your shoes each day to allow the moisture in the footwear to dry out completely. Keep your feet dry with talcum powder (antifungal). Do not wear tight-fitting shoes, especially during warm weather. Wear socks made out of cotton, wool or fabrics that wick away moisture from the skin. Allow your feet to breathe by frequently slipping out your footwear. The same pesky fungus that causes athlete's foot also causes ringworm and jock itch. You can deal with them in the same way. Tinea Infections: Athlete's Foot, Jock Itch and Ringworm. American Family Physician. https://www.aafp.org/afp/1998/0701/p177.html. Published July 1, 1998. Manohar J, P. G. Antifungal activity of apple cider vinegar against clinical isolates of candida species. International Journal of Current Research. http://www.journalcra.com/article/antifungal-activity-apple-cider-vinegar-against-clinical-isolates-candida-species. Published 2010. Pinto TMS, Neves ACC, Leão MVP. Vinegar as an antimicrobial agent for control of Candida spp. in complete denture wearers. Journal of Applied Oral Science. http://www.scielo.br/scielo.php?script=sci_arttext&pid=S1678-77572008000600006. Published 2008. Ledezma E, DeSousa L, Jorquera A, et al. Efficacy of ajoene, an organosulphur derived from garlic, in the short-term therapy of tinea pedis. Mycoses. https://www.ncbi.nlm.nih.gov/pubmed/9009665. Published 1996. Nelms CB-. Get More Out of Mouthwash Than Just Fresh Breath. AARP. https://www.aarp.org/health/healthy-living/info-2018/household-uses-mouthwash-fd.html. Published March 16, 2018. Shrestha A, Rimal J, Rao A. In vitro antifungal effect of mouth rinses containing chlorhexidine and thymol. Journal of Dental Sciences. https://www.sciencedirect.com/science/article/pii/S199179021100002X. Published March 21, 2011. Hammer KA, Carson CF, Riley TV. In vitro activity of Melaleuca alternifolia (tea tree) oil against dermatophytes and other filamentous fungi. Journal of Antimicrobial Chemotherapy. https://www.ncbi.nlm.nih.gov/pubmed/12161399. Published August 2002. Rocha Soares MMS, Cury AE. In vitro activity of antifungal and antiseptic agents against dermatophyte isolates from patients with tinea pedis. Brazilian Journal of Microbiology. http://www.scielo.br/scielo.php?script=sci_arttext&pid=S1517-83822001000200012. Published 2001. Derby R, Rohal P, Jackson C, Beutler A, Olsen C. Novel treatment of onychomycosis using over-the-counter mentholated ointment: a clinical case series. The Journal of the American Board of Family Medicine. https://www.ncbi.nlm.nih.gov/pubmed/21209346. Published 2011.
how do i know when it is healed…..the little tiny crevice is healed up and it looks like new skin which is flaking a bit….not red anymore….my doc said i could stop using the anti fungal, but because of the tiny flaking skin, i am nervous the infection is still there…. It is good to know that your condition is improving. As the redness is gone, the flaking could be because of dryness, consult your doctor and get a moisturizer that suits you. Do let us know about it. My son is 10, and plays football over the summer intensively. He’s tall and big for his age, and wears size 8 shoes. The training program they’re on is three consecutive days a week, 10am-3pm. He came home with what looks like athlete’s foot on both feet. I’m guessing from the heat and boots. Last year he got a verruca (which drive me mental – I used ‘Avoca’ as it was quick and he needed them gone for the football season. It didn’t hurt him). However, I’m still a bit frustrated that this year, it’s athlete’s foot 🙁 Anyway, I’ve done nearly everything I can tonight, from washing them and drying them properly, applying rubbing alcohol, then spraying Daktarin athlte’s foot power spray. I had to put socks on him as he’s always moving around. Then, he showered later and I dried his feet separately. Applied rubbing alcohol again then put vicks on and socks for bed. I feel like I may have done too much..? And I’m also freaking out about it spreading. I’ve washed my hands 1000 times and he’s on strict orders NOT to touch his feet. My comment is more of a question. Is there any advice someone could offer us, as he’s actively training every week and only has one pair of football boots to wear and 2 pairs of football socks for his training. The football uniform is strictly worn. He can wear flip flops tomorrow when he comes home. But the quickest fix would be best… if anyone has any ideas… please?! The skin was flakey and peeling and almost raw looking where the fungi is. Kind of like when a blister splits on his little toes and fourth toes and big toes. With a few much smaller flakes and circle flakes on the soles of his feet. Not red or sore looking. He doesn’t feel discomfort or itchy but the peeling gave it away. Help please.. not just him, I don’t want to get it either. 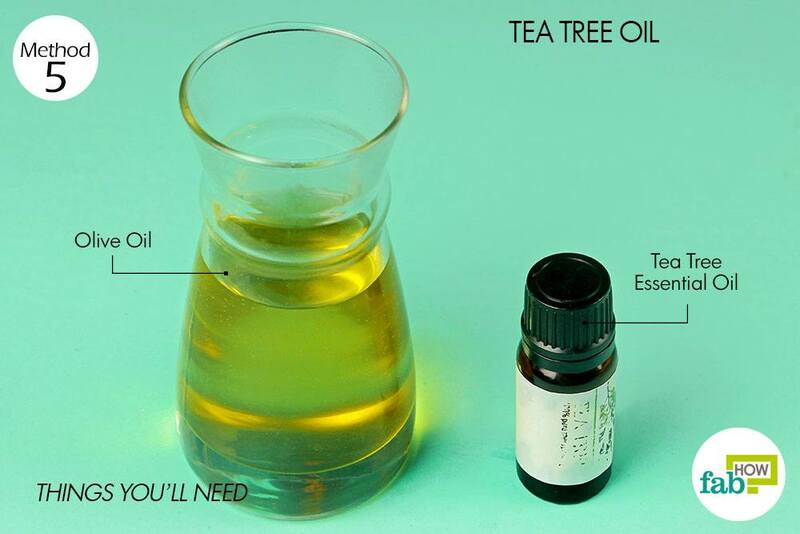 I’m planning on trying the tea tree oil treatment. We are sorry to hear about your son’s condition. Just don’t panic and avoid touching & scratching the affected area. We would recommend a soak in the first place. Simply take some lukewarm water in a tub, large enough to soak your son’s feet. 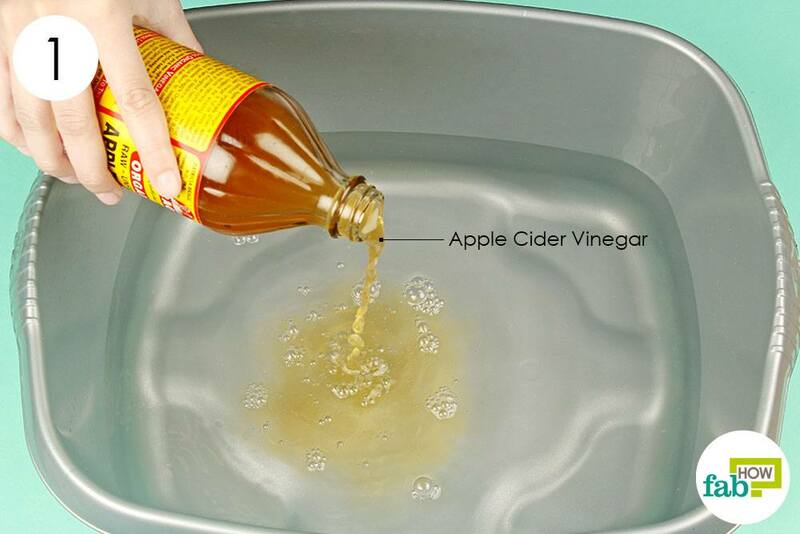 Pour in Apple cider vinegar(with the mother)/ white vinegar, whichever you have handy at home. If you do not have it, get some from your nearest stores. This kills the fungus and prevents it from spreading. Hi I got rid of athletes foot and haven’t got it back so far. 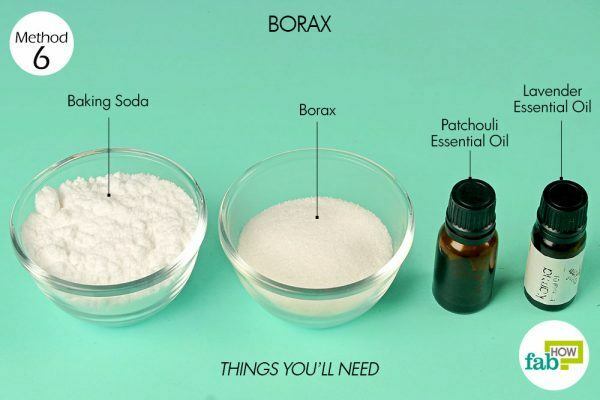 What you have to do is brave it and soak your feet on pure white vinegar with no water just vinegar for about an hour . I did this and it’s been gone for days . Don’t mix it with water as it is not strong enough to kill the fungus. PS your feet are gonna hurt for a day maybe but it worth it . 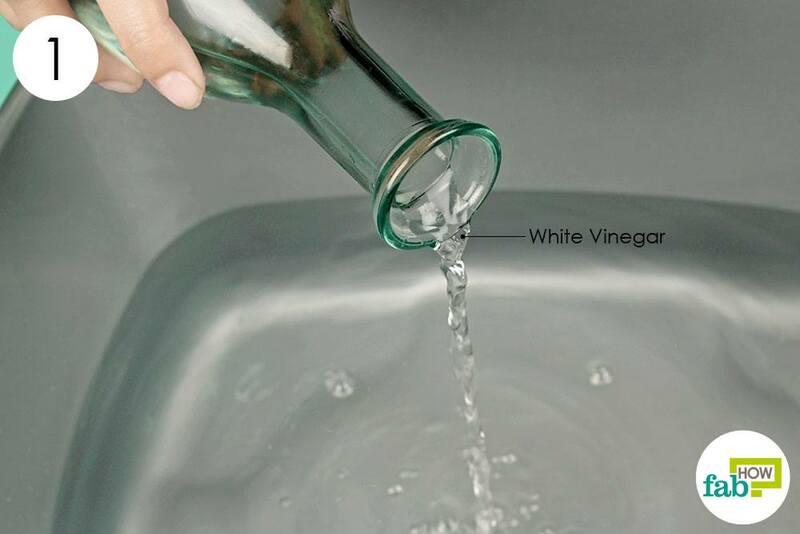 It is great to hear that undiluted white vinegar worked out well for you. However, we cannot suggest it for everyone, as it may hurt the ones with very sensitive skin causing burning. That is why we suggest diluting it before the soak. But kudos to you, hope it never returns back.